It looks, from the front, like a bad accident between a cargo ship and a loading ramp. But this mass of metal on display in Nakusp, British Columbia, played an important role in Canadian rail history. 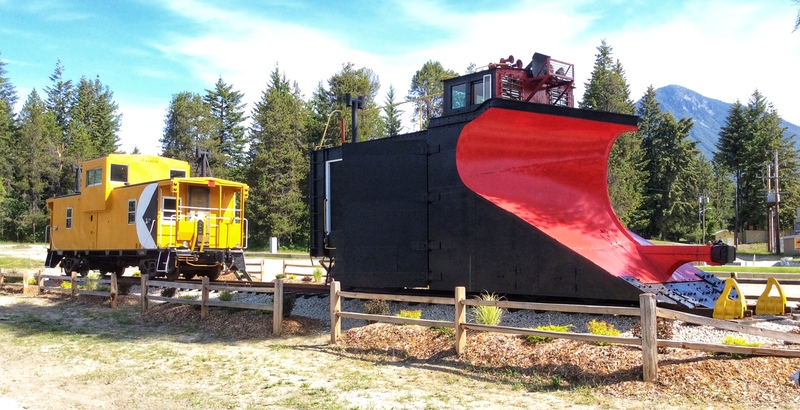 Winter-worn residents of rail-side communities might recognize this machine for what it is: a snowplow, or, more accurately, a wedge plow, used to push snow off rail lines in winter. 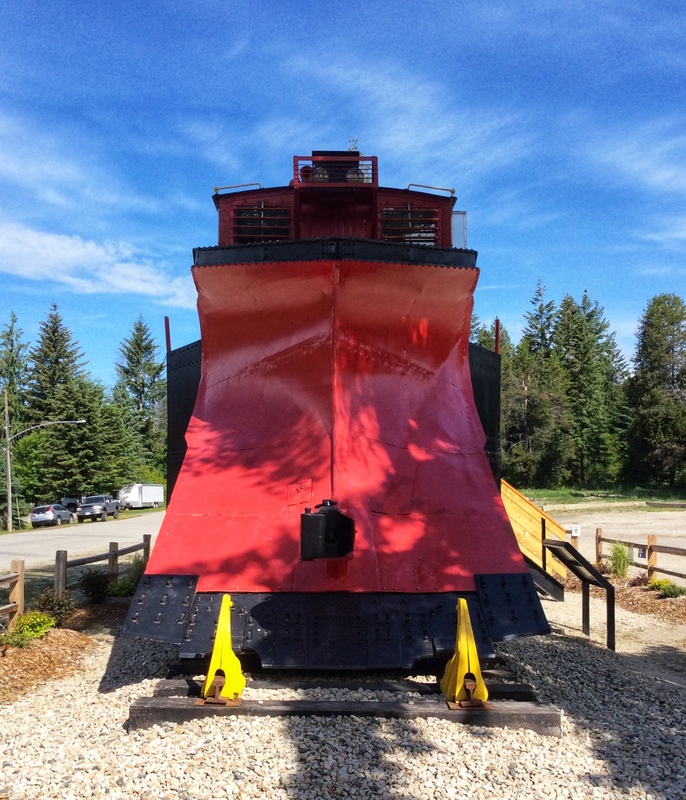 Wedge plows — this one in Nakusp was built in 1921 by the Canadian Pacific (CP) Railway — are specially designed to move large volumes of snow from railway tracks in North America. The big lower wedge (ramp-like portion) lifts snow high above track level, while the vertical “prow” directs the white stuff to the sides of the track, away from the front of the train. Rectangular wings on either side of the plow’s body can be adjusted outward to help widen the span of the plowed path and prevent snow from falling back against the train. Wedge plows do not have engines; they must be pushed by one or more locomotives, ideally at speeds high enough to clear solid paths through heavy, wet or frozen accumulations. Plowing deeply covered tracks can sometimes be a long (and loud) process, but it’s a necessary one in this part of BC, known as the Kootenays, where annual snowfalls in the Selkirk Mountains and along the CP line at Rogers Pass are among the highest in Canada. 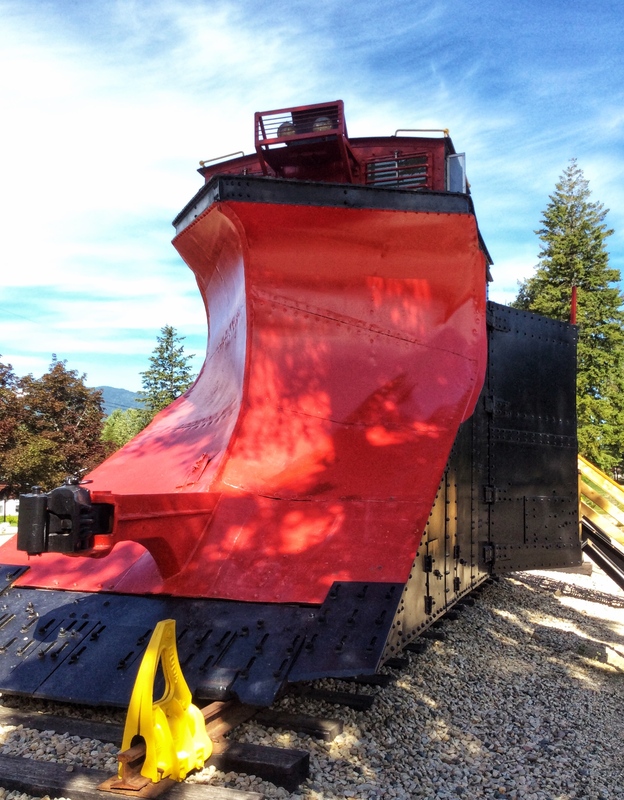 The wedge plow here in Nakusp — #400648 in the Canadian Pacific line — is one of just 36 such plows constructed by CP’s Montreal-based Angus Shops in the 1920s. The plow served in the CP fleet for decades. One just like it may have bulldozed wintry drifts from the old Nakusp & Slocan Railway (1894-1988), which connected the West Kootenays with the CP trunk line in Revelstoke. Other identical plows undoubtedly carved paths for trains carrying Kootenay ore and timber over Rogers Pass to markets in eastern Canada. In 2016, CP Rail donated the plow (along with a 70s-era caboose) to the Village of Nakusp. The Nakusp Rail Society has since restored the plow (and is working on the caboose), in partnership with the Village of Nakusp, the Arrow Lakes Historical Society and a host of enthusiastic local volunteers. 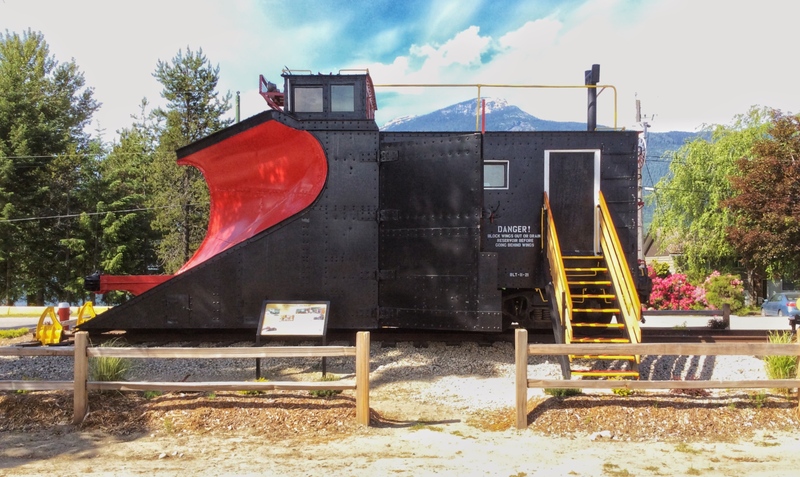 Visit CP Snowplow #400648 — a veritable battering ram of Canadian winters — in its permanent location on Broadway St. West, north of Sandy Beach (Nakusp’s municipal beach) and south of the Nakusp & District Sports Complex. The plow may now rest silently above the sunny lakeshore, but it’s not hard to imagine this 20-ton hulk thundering down the track on a frigid, blizzard of a day, parting seas of snow to keep Canada’s rail lines running. In fact, wedge plows like this one continue to clear tracks for CP Rail today. View a video of a CP Rail wedge plow in action. “CP Snowplow #400648,” Nakusp Rail Society, interpretive signage at snowplow site. Viewed on 29 May 2018. “Canadian Pacific Snowplow, 1923,” The Henry Ford, https://www.thehenryford.org/collections-and-research/digital-collections/artifact/177455/. Accessed on June 15, 2018. “The Nakusp and Slocan Railway,” Nakusp Rail Society, interpretive signage at snowplow site. Viewed on 29 May 2018. “Wedge Plow,” Wikipedia, https://en.wikipedia.org/wiki/Wedge_plow. Accessed on 15 June 2018.